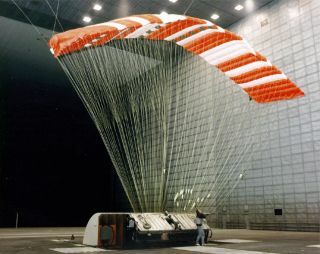 The parafoil undergoes testing in the world's largest wind tunnel at the Ames Research Center. In this historical photo from the U.S. space agency, the Pioneer Aerospace Parafoil (Advanced Recovery System II), undergoes testing in the world's largest wind tunnel, the 80 x 120 Foot Tunnel at NASA's Ames Research Center, Mountain View California, on Apr. 10, 1990.